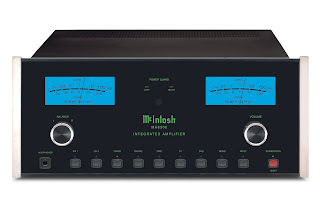 Mcintosh MA6300: It's McIntosh starting integrated amplifier which comes with high quality audio features. The MA-6300 is the latest integrated amplifier, rich with all the premium technologies that McIntosh is famous for, including Power Assurance System, Thermal Protection and Silent Electromagnetic Switching. With 100 watts per channel into 8 ohms and 150 watts per channel into 4 ohms the MA6300 can effortless power virtually any musical passage from any one of its seven source selections; CD1, CD2, Tuner, Phono, Tape, TV and DVD. The MA6300 utilizes the latest output transistor. The MA6300 runs cooler than many integrated amplifiers even at peak levels. The trademark “Blue Eyes” output meters grace the glass front panel along with controls for Balance, Volume, Mute,Standby/On, ¼” Headphone Jack and the Seven Source Selection Buttons. A turn on delay prevents pops or thumps generated in other equipment from causing annoying noises or damaging speakers.